The main point of Boss Baby, however, is that no matter who we are, we all know that feeling of being replaced - whether we’re an older sibling or an employee. I wasn’t quite sure what I was getting into with Dreamworks’ adaptation of Boss Baby. The original story is comprised of adorable board books about what it’s like when a new sibling arrives, but the film appeared to be a little more complex. Early on in the film I began to suspect that this was less of a kids’ film and more of a movie for the adult crowd, disguised with cute, animated babies. By the midpoint my suspicions were confirmed, but I wasn’t at all displeased by this revelation. 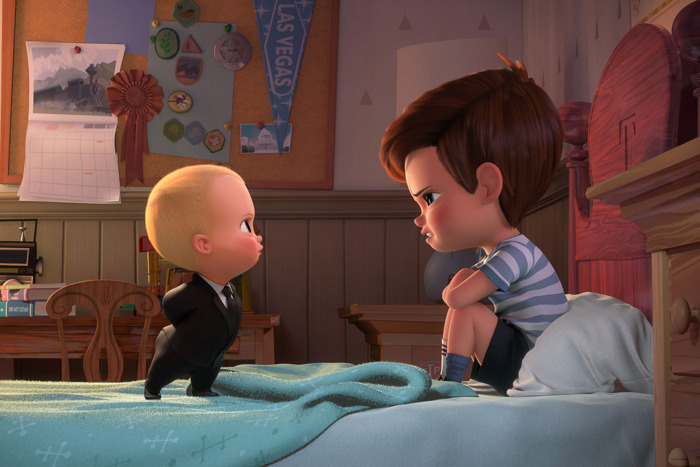 I think Boss Baby’s genius is that it’s a morality tale masquerading as a comic romp. People are more willing to entertain someone else’s ideas if they’re presented in a humorous way. Boss Baby takes a jab at corporate greed, climbing the ladder, and the wealthy. Plenty of jokes are made at their expense, leaving one to draw the conclusion that it’s not what you have that matters, it’s what you give, and the most important things can’t be purchased. You may get that corner office and become rich beyond your wildest dreams, but none of that matters if you don’t have love. Beneath all the jokes about the 1%, of course, there’s a human element that we can all relate to. I won’t give the story away, but Alec Baldwin’s portrayal of Boss Baby’s journey is by turns hilarious and heartbreaking. Throughout the film we see his character change because of his interactions with his supposed older brother, and, despite their clashing philosophies of life, learn to accept each other and even relate using each other’s language. The main point of Boss Baby, however, is that no matter who we are, we all know that feeling of being replaced – whether we’re an older sibling or an employee. It makes us feel irrelevant, useless, and forgotten. How we choose to operate out of those feelings says a lot about our character and the way we understand the world, both of which are formed in part by our experiences and how we were raised. I’m sure most of us have been through similar situations, whether in a nuclear family or in a new group dynamic at school, work, and play, but we could all probably use a reminder that we’ve all, regardless of our position in the dynamic, felt this way at some point in our lives. We can either take hold of whatever we have left and hang on tight, becoming greedy, angry, and fearful and letting that power our interactions with others, or we can operate out of a welcoming spirit, taking comfort in the fact that we belong and that there is always more love to go around. I know it doesn’t always feel like that. There are times when we get left out or ignored. There will be more experiences like that. But life doesn’t always have to be that way. We don’t have to take someone else’s place so that we have one. We don’t need to push others out of our way to get to what we want. There’s room for all of us. The problem is that oftentimes, we’re told that there isn’t room for everyone. We’re told that we have to shove people out of the way and refuse to share because what we have isn’t enough. We need to stop listening to the lies long enough for the truth to be heard: There’s plenty of love to go around.